In this issue of Radiology, Orlhac et al (2) adapt a method originally used in genomics to correct variations in radiomic measurements caused by different imagers and imaging protocols (2). The proposed method is based on a statistical method called ComBat, which is readily available in the open-source R statistical programming language (R Foundation for Statistical Computing, Vienna, Austria). Unlike other previously published methods, this approach does not require images to be modified. Background: Radiomics extracts features from medical images more precisely and more accurately than visual assessment. However, radiomics features are affected by CT scanner parameters such as reconstruction kernel or section thickness, thus obscuring underlying biologically important texture features. Conclusion: Image compensation successfully realigned feature distributions computed from different CT imaging protocols and should facilitate multicenter radiomic studies. 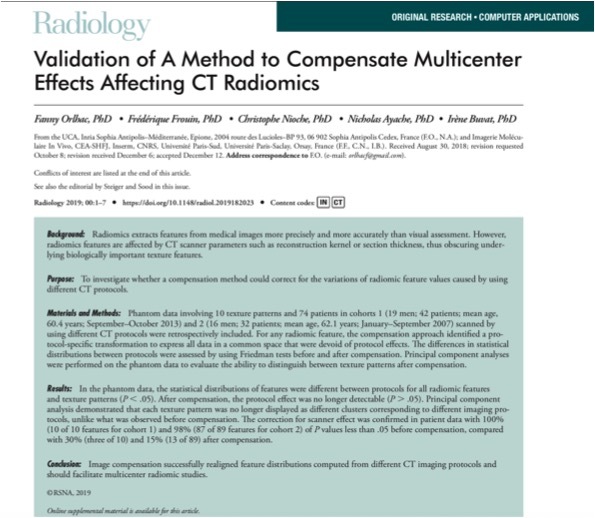 * Radiomic feature values obtained by using different CT imaging protocols or scanners can be corrected for the protocol or scanner effect by using the proposed compensation method. * The use of realigned features will enable multicentric studies to pool data from different sites to build reliable radiomic models based on large databases. * The proposed compensation method is easily available, fast, and requires neither phantom acquisition nor feature recalculation. There are limitations. Although the model was built with rigorous methodologic structure, a multicentric study collecting a larger number of patients would be necessary to check for the generalizability of the radiomics signature. The influence of different CT parameters (eg, kilovolt, milliampere-seconds, and reconstruction filters) on extraction of radiomics features was not among the objectives of this study, although this is a relevant variable that might affect data consistency and limit the extensive use of the model. A correlation with genomic profile of biliary tract cancers may have been desirable, especially in the era of target therapy where specific genomic profiles are associated with either response or resistance to a specific drug. Nevertheless, radiomics approaches seem to have a bright future, especially if collaborative multidisciplinary teams are involved. Ultimately, to achieve personalized medicine, personalized imaging must be involved. “Ultimately, to achieve personalized medicine, personalized imaging must be involved." “The further goal of radiomics analytics is to develop decision support tools, such as predictive models, by incorporating radiomics signature and other morphologic features. Radiomics models providing individualized risk estimation of LN metastasis have been developed and validated in studies focused on esophageal, colorectal, and bladder cancers with good results." "Radiomics uses advanced image-processing techniques to extract a large number of quantitative parameters from imaging data, and its potential to improve diagnostic accuracy is increasingly being studied . Initial studies have reported promising performance of radiomics with and without the use of machine learning in the prediction of the prostate cancer Gleason score." "In conclusion, this study compared the use of mean ADC and radiomics with machine learning for the characterization of lesions that were prospectively detected during routine clinical interpretation. Quantitative assessment of the mean ADC was more accurate than qualitative PI-RADS assessment in classifying a lesion as clinically significant prostate cancer. Radiomics provided additional data that ADC metrics (including mean ADC) were more valuable than other MRI features. In fact, at the current cohort size, no added benefit of the radiomic approach was found, and mean ADC is suggested as the best choice for quantitative prostate assessment." Purpose: To determine the feasibility of using a deep learning approach to detect cartilage lesions (including cartilage softening, fibrillation, fissuring, focal defects, diffuse thinning due to cartilage degeneration, and acute cartilage injury) within the knee joint on MR images. Conclusion: is study demonstrated the feasibility of using a fully automated deep learning–based cartilage lesion detection system to evaluate the articular cartilage of the knee joint with high diagnostic performance and good intraobserver agreement for detecting cartilage degeneration and acute cartilage injury. Machine Learning in Radiology: Applications Beyond Image Interpretation Paras Lakhani et al.